Our gratitude to Paul Hetzler, CCE St. Lawrence County, for letting us use this post. The IPM connection? ID those fuzzy beasts before you add them to your “warm and fuzzy” petting zoo. When I was a kid I was fascinated by caterpillars but had trouble with the word. To me, the sweet little woolly-bear traversing my hand was a “calipitter.” It was only years later I learned that a calipitter is an instrument used to measure the diameter of a caterpillar to the nearest micron. Caterpillars continue to interest me, although I no longer find them universally cute. Imagine the letdown and loss of innocence following the discovery that some of these fuzzy, fascinating, gentle creatures that tickled their way across my hand were venomous. This revelation was akin to finding out Bambi was a dangerous carnivore, which in fact is a fear that haunts me to this day. Stunning — and striking in a less-than-pleasant sort of way. White-marked tussock moth larvae, courtesy Wikimedia Commons. It seems a further injustice that many of the so-called “stinging-hair caterpillars” are among the cutest and most colorful out there. But at least they are not aggressive the way yellow jackets can be. They are strictly defensive, the defense being hollow hairs connected to poison glands that secrete toxins. The chemical cocktail is species-specific, and often involves serotonin, histamine, formic acid and various amino acids. The hairs inject their charge only when the critter is roughly handled. Or falls down your shirt, or gets in your sleeping bag, or is pressed against your skin in some other way. Their stings cause a painful rash which could persist a week or more. Some people have more severe reactions requiring medical treatment. You’d think poisonous caterpillars would be from exotic locales, but to my knowledge all in our region are natives. One large group is the tussock moth clan. These caterpillars look about as terrifying as teddy bears. 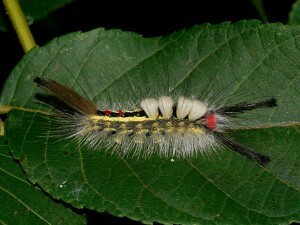 Two examples are the hickory (Lophocampa caryae) and white-marked (Orgyia leucostigma) tussock moths, common locally. I’ve had many encounters with these and their kin over the years. Hickory tussock caterpillars are mostly white, peppered with a smattering of longer black “whiskers.” White-marked tussock moth larvae look like they’re fresh out of clown school, with a yellow-and-black striped pattern, bright red head, a pair of super-long black appendages as a headdress, a row of lateral white hairs on each side, and four bright yellow (sometimes white) tufts behind their heads like a row of smoke stacks. The stubby brown hag moth caterpillar (Phobetron pithecium) definitely does not look like a caterpillar. It could easily be mistaken for a dust-bunny or bit of lint. Sometimes known as the monkey slug, this oddity has eight furry, arm-like appendages and should get a prize for its resemblance to a plush toy. If you come across the monkey slug, do resist the impulse to cuddle it. Much like the way poison-arrow frogs dress flamboyantly to advertise they’re a poor choice as prey, some toxic caterpillars have paint jobs even brighter than those of the tussock moths. For example, the brilliantly attired stinging rose (Parasa indetermina) and saddleback (Acharia stimulea) caterpillars might make you think some practical joker has set out miniature party piñatas. Eye-catching and bristling with barbs, no one is going to mistake them for a plush toy. Fortunately, many poisonous caterpillars look the part. The Io moth (Automeris io), a huge moth bearing a striking eye-spot shape on each wing, starts out as a neon-green (red until its first molt) caterpillar crowded with serious-looking barbs. Going further afield, the giant silkworm moth caterpillar (Lonomia oblique) of southern South America has been responsible for as many as 500 human deaths — and it looks terrifying, too. Keep in mind that just about every fuzzy caterpillar, venomous or not, can induce asthma. Those hairs are fragile and readily become airborne. Pests such as the eastern and forest tent caterpillars — and gypsy moths too — sometimes occur in numbers so great enough to trigger asthma, especially in children. Even the beloved woolly bears (many species of the family Arctiinae) trigger attacks in some people. What to do for a sting? Use Scotch or packing tape on your skin to pull out embedded caterpillar hairs (along with a few of your own). Wash the area and isolate clothing you think might harbor stray hairs. Monitor for several hours for signs of a serious reaction and otherwise treat the rash the way you would any sting with calamine lotion, antihistamines, or hydrocortisone lotion as directed by your doctor. Let’s hope that having a few bad apples around will not keep you from appreciating caterpillars. Even the ugliest ones grow up to be moths and butterflies, many of which are beautiful. And they’re all important pollinators. Stay away from the ones described here but feel free to investigate all others. Just be sure to take along your callipitter.